Your next go-to gigging keyboard? 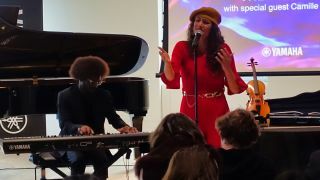 Held at Yamaha Artist Services, the company’s flagship performance/rehearsal space in Midtown Manhattan, the event featured a pre-release look at new products from the company’s different musical divisions, most of which will be unveiled at the 2019 NAMM Show in Anaheim, California. Yamaha’s CP4 stage piano has been a hot item since its release in 2013, and can be seen on-stage with artists such as Chuck Leavell (The Rolling Stones) and Christine McVie (Fleetwood Mac). Now Yamaha has upped its digital piano game with the brand new CP73 and CP88, featuring improved sound sets, actions and audio/MIDI capabilities. The CP88 boasts 88 keys, a graded, triple-sensor NW-GH3 keyboard with Synthetic Ebony and Ivory Key Tops, all-new piano and auxiliary sounds (including upright pianos and a Bösendorfer grand patch), all in a gig-able aluminium chassis that weights-in at 41lbs. Yamaha’s CP73 takes the same sound generation engine as the CP88, but puts it in a transportable 28-lb package with a Balanced (not graded) Hammer 73-note action. To demonstrate the CP88, Yamaha had ace keyboardist Will Wells on hand, known for his work with Imagine Dragons and Logic, and on the famed Broadway musical Hamilton. He performed a new original song along with vocalist Camille Trust, which showcased the keyboard’s gorgeous new upright piano and electric piano patches, seamless sound switching ability, and patch layering options. One complaint artists had about Yamaha’s previous stage piano, the CP4, was its plastic external chassis. The CP88 feels much more satisfying with an all-metal build that screams ‘substantial’. We got to put our hands on the CP88 (the CP73 was not available at the event), and were impressed with its new wood action, and its plethora of immediate sound-editing options. With these new stage pianos, Yamaha has definitely taken a cue from manufacturers such as Nord, who make on the fly sound shaping easy and intuitive. And, with its new interface that features four independent sound sections (Piano, Electric Piano, Sub, and Master for effects), grabbing and tweaking a sound on the CP73 or CP88 is fast and fun. Keyboard is awaiting a test unit and should have a detailed review online in the next few weeks.